New Orleans Study after study details the fact that with 45 million Americans employed in low-paying service sector jobs paying usually minimal wages for often part-time hours in a period of almost record low unemployment hovering around 4%, work in this age of excruciating inequality is simply not enough to get a family out of poverty. A lengthy New York Times magazine article by Matthew Desmond of Evicted fame piled on as well. Let’s face it, there is a work-myth that has gained ideological dominance for the last almost 50 years in a straight line from Ronald Reagan to many lesser rightwing conservatives today. The heart of the myth is that there is a magic bullet that will eliminate poverty, as if they really cared, and that bullet is work, no matter how little it pays, how large the family, or where you live. In these dark times states regularly bumping their butts on the bottom of the income ladder are competing to see how draconian they can be in punishing the poor for their own poverty. West Virginia seemed to be winning the race for quite some time, and jumped out ahead of this rat pack in requesting an exemption from the federal Center for Medical Services (CMS) so that they could require a work test to receive the expanded Medicaid healthcare benefits allowed to the working poor under the Affordable Care Act. Arkansas though jumped to the front of the death march in both securing the exemption and trumpeting their own cruelty. Governor Asa Hutchinson recently lauded the fact that the state had been able to jettison 4300 from the expanded Medicaid program in the state for failure to report on their efforts to find work. The requirements are 80-hours of something work-like such as training, job searches, or their equivalency. If reports are not timely and correctly filed for three months, then the state has seized the right to bar you from health insurance for some period of time, regardless of the circumstances or in fact your health. Many of the recipients were exempted from this requirement because of infirmities recognized by the state or the fact that their children were too young, but the rest had their backs against this work-vs-welfare ideological wall. The governor claimed that 1000 got jobs, but lord knows whether that made them less poor and it certainly did not necessarily mean that they were off of Medicaid. There are 16,000 Arkansas families that are on the bubble, and these 4300 are the ones that hit the 3-month mark of failing to get their reports into the state in a timely fashion. 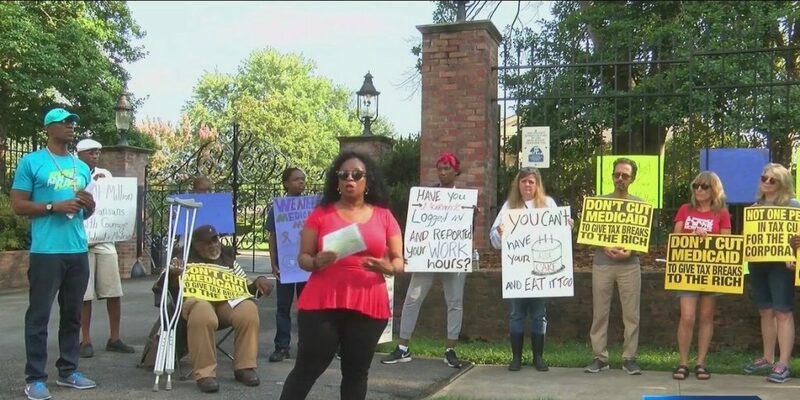 Experts and observers nationally and in Arkansas are asking CMS to suspend approval of these work requirements until there is more information on why so many are being disqualified. Is it inability to access the internet, difficult forms, illiteracy, distance from state offices, or what? Studies in other programs and states have established that simply requiring regular reporting period will reduce the rolls for entitlement programs. There is no doubt on one score. People will die without healthcare and while conservative ideologues tout their success in punishing the poor. Who will ever wash the blood off of their hands? This entry was posted in Citizen Wealth, Financial Justice, Health Care and tagged arkansas, Medicaid, Work requirements by Wade. Bookmark the permalink.